Thermaltake's Water 3.0 360 ARGB Sync is a watercooler for those who live and breath RGBs, as it is compatible with all the software suites found on motherboards so you can create your own lightshow. It is compatible with all current sockets from both AMD and Intel, the only compatibility issue you might have is fitting the 360mm radiator into your case. In Kitguru's testing it even performed well while cooling, but really it's all about the RGBs. "There’s a lot to unpack from the name of the Thermaltake Water 3.0 360 ARGB Sync. The ‘360’ obviously refers to its 360mm radiator, and we know ARGB = Addressable RGB lighting. The ‘Sync’ aspect references software compatibility for the Water 3.0 360 with current motherboards ..."
Thermaltake has a impressive offer for anyone who needs a new or back up rodent and doesn't want to spend a lot of money. The Talon Elite RGB Gaming Gear Combo is a mere $30 and offers a mouse with a PMW3325 sensor, Omron switches, RGBs and a half dozen buttons, plus they've included a mouse mat. It isn't the best mouse that TechPowerUp has used, but you can't complain too much about a few imperfections at that price. Check it out here. "When it comes to mice, Tt eSPORTS is mostly known for their great prices. The Talon Elite RGB Gaming Gear Combo is no different as it offers mouse and mouse pad for below $30. The mouse features a PMW3325 optical sensor, main switches rated for 20 million clicks, and, of course, a lot of great-looking RGB effects." Podcast #524 - NVIDIA RTX Titan, Snapdragon 855, and Logitech Racing Wheels! Our podcast this week features discusion of the new RTX Titan, Snapdragon 855, NVIDIA AI technologies, the new Google Pixel Slate, and more! 01:08:54 - Microsoft's Chromium Browser? Following the release of the Engine 27 two years ago, Thermaltake is taking another stab at the Sandia Labs and CoolChip Technologies inspired air bearing metallic fan heatsink with the tiny Engine 17 cooler which, at a mere 17mm tall, is suitable for even the smallest SFF systems. The Engine 17 CPU cooler is compatible with the newer Intel 115x sockets (LGA 1150, 1151, 1155, and 1156). Measuring 95.1mm x 95.1mm x 17mm, the heatsink features a round nickel plated copper base that contacts the CPU IHS. A metallic PWM fan (9 CFM) with 40 blades spins at at 1,500 to 2,500 RPM while a thin layer of air acts as both a bearing and a heat exchange layer. A ring of 119 angled stationary fins surround the fan and help with cooling. The Engine 17 cooler has a notably small footprint with the entire cooler staying well within the bounds of the socket mounting holes and barely covering the VRMs in Thermaltake's demo images. There is definitely no need to worry about RAM compatibility with this cooler. The downside, of course, is that the size limits the processors it can cool. Thermaltake claims that the smaller Engine 17 cooler can cool up to 35W TDP processors and while it may not win any temperature feats, it should at least be fairly quiet (it is rated at 11 to 23 dBA). It would enable a very thin SFF system with an AMD Ryzen 5 2400GE or Ryzen 3 2200GE or Intel Coffee Lake T-series e.g. i7-8700T) CPU. Such a system could be used as a quiet and discreet home theater PC or game streaming endpoint or (as Thermaltake is playing up) in a 1U server for low power servers and networking devices. The Thermaltake Engine 17 will be available soon though exact dates and pricing are still to be determined. It will likely be a bit less than the larger $47 Engine 27 cooler though. The only difference between the Core 21 and View 21 is the front panel, the Core G21 sports a matte grill while the View 21 offers a smoky glass front panel. This makes it somewhat easier for [H]ard|OCP to review both cases at once. They both offer extensive cooling options, the front can house your choice of to two 140mm fans, three 120mm fans, or a radiator between 120mm to 360mm in size. The top of the case can support a 120 or 140mm fan, the bottom another 120mm fan in addition to having an intake for your PSU, neither can support a radiator, however the rear can accommodate a 120mm fan or rad. $70 is a decent price for a case sporting tempered glass, however [H] did feel Thermaltake should have included more than just a single fan in the package. Get the full details here. "This is a two-for-one review: Thermaltake's Core 21 and View 21 Tempered Glass Edition cases are identical aside from the front panel. Both cases feature tempered glass panels that show off your build, and we'll find out what difference the drastically different front panel designs have on case performance." Just like any other terrible memory, no matter how hard you try to suppress it, it will come back to haunt you occasionally; in this case it is Disco that will not die. 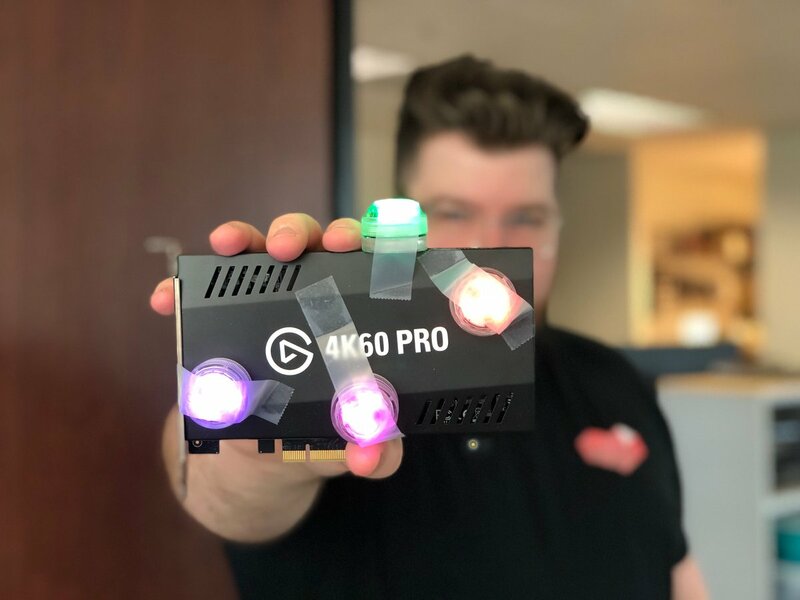 We have recently seen several Thermaltake products which feature their Frag Harder Disco Lights and their PSU that [H]ard|OCP just reviewed is no exception. You will have to check out their full review to find out more about the RGBs but as far as performance in your system goes, this PSU received excellent marks across the board. It is a little on the expensive side at first glance, however the sleeved cables do make up for that if you are looking for clean cables; purchasing them as a separate upgrade quickly evens the pricing compared to other 1250W PSUs. "Thermaltake's new Toughpower computer power supply comes complete with Frag Harder Disco Lights, but what we want to know is how does it do when it comes to delivering clean and efficient power to your system. This new 1250 watt PSU has fully modular individually sleeved cables and has plenty of power where you need it." Podcast #459 - Threadripper Pricing, Liquid Cooled VEGA, Intel Rumors, and more! Join us for Threadripper Pricing, Liquid Cooled VEGA, Intel Rumors, and more! 0:51:40 The Oculus Pacific, bringing VR to the masses? 1:41:04 Allyn: Still using WMC? You need EPG123! Thermaltake has a new cooler for those planning a Ryzen build on a budget, or for quiet system builds. The Contac Silent 12 is a mere 153x12x100.3mm in size, with the fan attached, and weighs a paltry 700g however it is capable of almost matching the performance of AMD's Wraith cooler while operating at a noticeably quieter level. In addition to the heatsink you will find a 'low-noise cable' which changes the fans RPM span from 500-1500 RPM to 400-1100 RPM however in their tests The Tech Report found it had little effect on the noise produced by a system under load. See the full results here. "Thermaltake's Contac Silent 12 relies on an established design and a simple mounting system to get AMD Socket AM4 builders up and running as quickly as possible. We tested this cooler at stock and overclocked speeds to see how it stacks up for just $25."